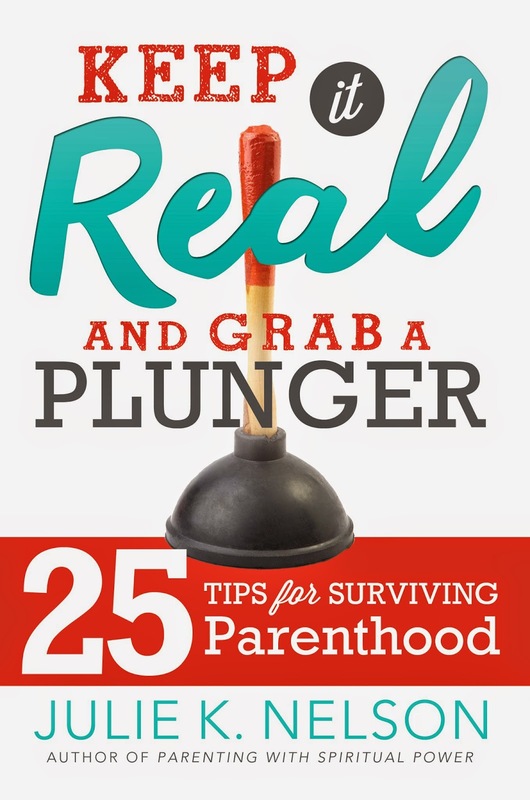 With her refreshing sense of humor and a “let’s be real” attitude, Julie K. Nelson has written a fun and fast read to help parents in any stage of raising children.Keep it Real and Grab a Plunger: 25 Tips for Surviving Parenthood is written just as described. Each tip is a little mini chapter—perfect for reading while waiting in the carpool, waiting for dance lessons to be over, or even (ahem!) sitting in the bathroom. I loved Julie’s conversational style of writing and her shared experiences—the good, the bad, and the ugly that we can all relate to. I also loved the breadth of her tips. She covers everything from potty training to helping teenagers find their greater purpose in life. She also shared sobering and difficult personal experiences of how to navigate parenting during divorce and re-marriage. Her tips seem doable and non-intimidating. This book was always interesting, even when I felt a particular tip was not applicable to my family’s stage of life. I enjoyed the real nuggets of wisdom in this book. For example,the difference between praise (compared to a Pop Tart) and encouragement (compared to fruits and vegetables), and the related topic of being process-oriented versus outcome-oriented as you guide your children, really struck me. It made me pause to examine myself and how I was communicating with my children. I realized that giving praise on an outcome was passing judgement on a child, while giving encouragement through a process is much more loving, motivating, and character building. Lastly, I love it when other mothers are candid. I feel that it gives me permission to do the same, something that can be scary for me. This book helped me feel comfortable in admitting, and sometimes laughing about, the craziness that is sometimes in my home. I came away with little suggestions that did not feel guilt-inducing, but just something that a good friend might suggest. This is a great book, with something in it for everyone. In Keep in Real and Grab a Plunger, humor and wit abound as encouragement, stories and relate-able experiences are shared. Many topics (and age groups) are covered: family vacations, talking to teenagers, encouragement and praise, helping kids when they make mistakes, helping kids overcome fears, potty training, and MANY MORE! The author gives you a very real glimpse into her day……I’m sure most moms could relate! As a home school mom, I have a different set of challenges, but I have seen family and friends go through many of the challenges. For example, I don’t have to worry about the frantic “Get-your-hair-fixed-NOW-so-you-don’t-miss-the-bus” scenario, or the “lemme-hurry-and-pack-a-lunch” one either, but….MOST of the book deals with the everyday challenges of being a mom. This is a fun book for every parent! It is filled with great advice and perspectives that are easy to implement! My thoughts: I just had to review this book when I saw the title of it, since sometimes parenting can be about trying to survive (I don’t mean this in a bad way!). ;) I love the practical information in this book that helps parents to connect with their kids and help instill good values. I like her ideas for making meal time fun and a chance to connect with your kids and spouse. I also appreciate her thoughts on raising kids in a technology savvy world, how to make sure that they don’t have an addiction to social media and teaching them the importance of having meaningful conversations and relationships. This is an excellent resource for parents! First Line: I wake up at 7:00am and take a shower. What I Thought: Since my mothering days are over, I’m always looking for ways to cheer on the mothers of my grandchildren. This book is the ticket. Instead of the usual guilt ridden prose of many parenting books, Nelson takes realistic view of the parenting role. She speaks with authenticity and from experience. A perfect gift for that mother that is in the trenches, day in and day out. Julie also uses a lot of humor in her writing which made this book an enjoyable read. For example, at the beginning of one of her chapters this is what she says, “What should be one of our main parenting goals? Survival? Yes, and that’s enough some days.” I couldn’t agree more! As always when I review a non-fiction book with tips of any kind, it is too hard to list everything that I liked and learned. So here are some things I really enjoyed reading in this book. –Eight Values That Are Common to Strong Families: Some of those values included: Choices and consequences,Hard work is good for you, Integrity, Serving Others and Love. –How to Stop Yelling at Your Kids: Some of the ideas were to take a break, go for a walk or write down your thoughts. Whatever it would take to calm down and not yell at your children. This is a skill that all parents can work on. –Strategies for Keeping Siblings Close: I liked the ideas of how you need to teach your kids to support each other, give them opportunities to do things together (whether they want to or not), and learn to make happy memories from doing things with each other. 2. Avoid anonymity and intolerance,and 3. Check, pry, and supervise. I feel every parent with tweens and teens needs to read this chapter. In the end I feel like this is a good parenting book that would benefit new and experienced parents. Even if you pick out a few things to try and use with your family, I feel you will see some good changes. This book can be read at several different sittings or when you specifically need information about a certain topic. This book would be a great Mother’s Day present or a gift given to new parents at a baby shower. There was so many things I liked about this book, it’s hard to know where to start. There were so many thoughtful messages and advice. I appreciated them all. Sometimes with parenting books, I feel lectured, or that everything I do is wrong when it comes to my kids, and I didn’t feel that way reading this book. I think there are many topics in this book that any parent in any stage could relate to. For example: Lifting Children Who Make Mistakes, How to Stop Yelling at Your Kids, Bedtime Routines (that was and is still a needed necessity in our home), I could go on and on. I recommend this book to parents who are first starting their journey, or like me, have older kids. We could all use a refresher. Oh, my goodness. What an amazing book. Every parent should read this book. Everyone who is planning to become a parent needs to read this book. It is full of the best advice I’ve ever read on parenting. Though each chapter was my favorite chapter, my most favorite chapter was Chapter 10, “Keep it Real and Wave Your Wand – making memories at mealtimes. This author has a sense of humor that makes this book even more fun to read. Not only that, but parents can learn so much about, not only surviving parenthood, but enjoying every step they take during parenthood. I strongly advice every Mom and Dad to read this book. You will not be sorry. Anyway, back to the topic at hand, I’ll admit that it was the plunger that grabbed my interest. That, and the use of the word “surviving” in the title. They both seemed very apropos for my current parenting experience. Blog tour~Julie K. Nelson with the book Keep It Real and Grab a Plunger: 25 tips for surviving parenthood | My Book Addiction and More! Is was an entertaining as well as informative, funny and educational book. While, my children are grown…Parents! Is is a great resource book! Filled with insight, resources to help enrich yours and your children’s lives. An informative, entertaining, and enjoyable read! A wonderful “self-help” book, packed full of knowledge, insight, information and a gem of a book. New and young parents, this would be a very helpful book, one in which, the reader, learns so much, it is unbelievable, how much information the author packed into this amazing book. Easy to read, with funny insights from the author’s own experience as a parent. I would recommend to both new and young parents. Enjoyable! Well written! I am not usually a “self help” reader, but I have read a few for reviews, and I have loved each of them. I don’t usually love reading about parenting, because it usually makes me feel like a horrible mother. This book on the other hand made me feel like “I might be doing something right”, and “Dang, those are awesome ideas”. It was a great book. The author is funny. She shares “real” life trials about raising kids, and shares some great solutions, examples, etc on how to handle them. I think one of my favorite parts of the book is when the author talks about how we don’t have to “reward” every kid. She was referring to sports. My kids are not in sports, thank heavens, but they have done some church sports at times. I laugh every time when they say “we have to reward everyone so no one feels left out”. WHAT? Seriously. I love how she addresses this issue in the book. How are we going to teach our kids the importance of good sportsmanship, how to be competitive without conflict if “everyone” gets recognized for the same effort. No. There are some kids that do more, and deserve the recognition of doing so. If others can’t handle it, too freaking bad. I do not want my kids growing up thinking they don’t have to put any effort into anything because they will get rewarded regardless. What she does say is how we should recognize each thing that they did do during their sport. If they made a goal, point, etc. or met or beat their previous best then it’s important to focus on those efforts. Letting them know we are proud of how much better they did and how proud we are they keep trying. It’s okay if we are not the best at everything, but to try our hardest at everything we do. I love how she tackles how to approach every day battles we may have with our kids in a more productive way. There are just so many great ideas that I intend to apply in my own life. I love how she talks about each stage of a child’s life. There are trials with every age, and she has some wonderful ideas on how to approach them. I really enjoyed this book. I love the humor that was in this book. As a parent there are times when I either have to laugh or cry. I wish I could say I always laugh, but that is not the case, but I try to. It was mentioned so many times in this book about how we will miss the days when our kids were young. I can attest to that. I was such a nervous nelly mother that it was hard for me to enjoy the “little” years like I should have. I cannot tell you how much I wish I could have been able to relax a little more and enjoy my kids when they were little. I have to admit that I don’t always “love” the teenage years, but I am trying every day to appreciate my kids because now, with one in college it has hit me in the face about how much I missed so many opportunities with our kids. I had to get something done. I had to do so and so. The author address this many times, and I loved each and every one of them. This book was inspirational and so insightful. I loved every minute of it. Not once did I feel like I as inadequate as a mother. Instead I found great ideas to hopefully make my household run more smoothly.